The last episode (more or less for now)!!!! The first ship to explore the Dyson Sphere of Astrus was the ISS Intrepid, an Aegis Division cruiser assigned to deep space exploration and research. While cataloging systems in the Far Rim they stumbled across a vast construct, what looked much like a Dyson Sphere of immense age and incredible design. The sphere had been drifting in its own orbit, headed out toward the rim of the galaxy for millions of years. Some dating efforts suggest it had been in transit for close to thirty six million years now. Astrus became an instant sensation when it was discovered that the interior world contained dozens of sentient races, many of which were genetically identifiable to current existing species, although with enough distinct differences to suggest some form of parallel evolution. The first explorers discovered evidence of colonies set up by the ancients of the Coreward Expanse, and began looking for evidence that they might still exist in Astrus in some form. What they found was more perplexing than anything; evidence of dozens of other civilizations, most never before seen, that had previously encountered the sphere and then just...disappeared. It was the discovery of the Observer, an enigmatic figure that appeared to be a force-field projection by impressive working ancient technology that took the first explorers by surprise. In the decades of initial exploration the mystery of the indigenous races, the disappearance of prior explorers and the question of who built the sphere and why were of preeminent concern. But when the Observer manifested and changed those explorers, many questions began to be answered. Since the incident, two more research expeditions have met similar fates. In 2854 a Tetragon Union vessel approached the sphere and attempted to sieze control of the machine's inner workings, but something happened, and the crew disappeared (presumably changed), and their vessel outside was pulled into what appeared to be a black hole which disappeared as suddenly as it manifested. Today, researchers who attempt to explore Astrus take careful measures to arrive without any technology at all, space-dropping in and going native for as long as possible. It has been determined that the Observer only takes notice when a full expedition with gear and tech arrives. There is a suspicion that for whatever reason Astrus is some sort of ancient "eco-reservation" of long lost alien species. Still others think that the unusual genetic similarity of the aliens on Astrus suggests more sinister purposes. Groups like the Tetragon Union are convinced that the technology of the sphere will make them invincible, if they can just defeat the Observer. Today, the Federated Commonwealth assigns cruisers to routinely survey and observe Astrus from a distance, and to act against any unauthorized aggressor or incursion from threats such as the Tetragon Union, while providing scheduled pick up and drop-off of Academy scientists and Aegis investigators who "go native" to explore the artificial world. There are a number of aquatic species in the galaxy that have achieved spaceflight (such as the fashan and kokatik) but the aquarians are actually a transgenic species of humanity which were part of the slow-FTL starship DSE Poseidon. The Poseidon arrived at the star Lacaille about 12 light years distant from earth, finding that Lacaille VI, dubbed Leviathan, was suitable for habitation as expected. 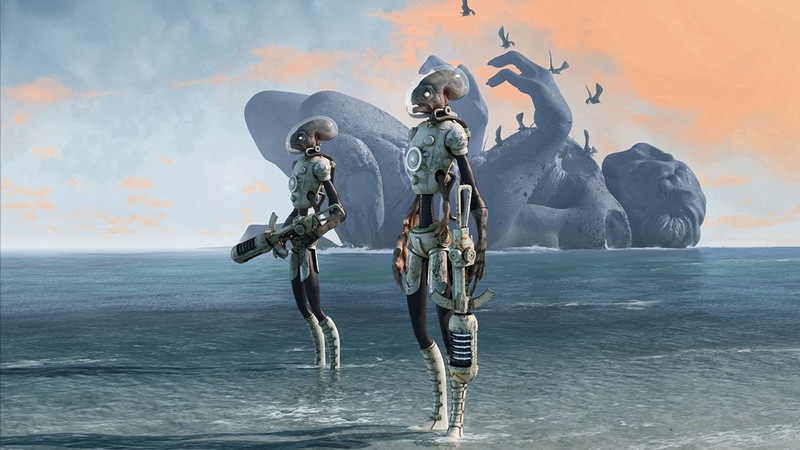 The people of Poseidon came ready; transgenic modifications were already part of the plan to make humanity functionally capable of living on the water world. 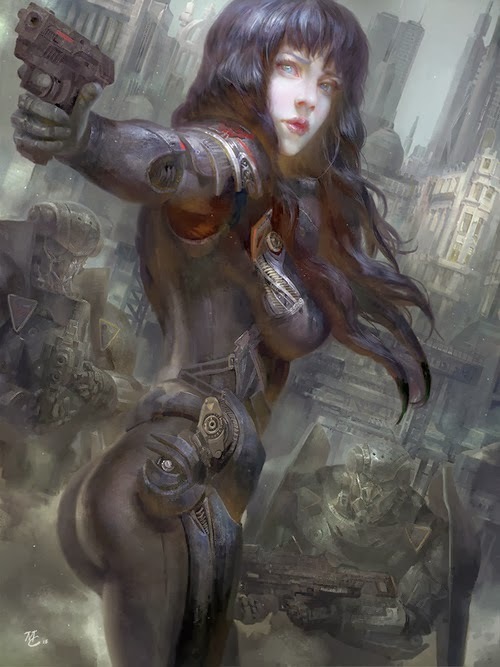 The aquarians survived for two and a half centuries before contact with the Terran Order was established, and they rebelled against Terran control for ten years before the Terran Order fell apart through civil war. Today, the aquarians are a valued addition to the commonwealth of man. The deaders keep their homeworld secret, and probably for good reason; a lot of species are frankly terrified of the parasites, and although its been determined that they require dead tissue to reanimate and puppeteer (and not living tissue) the mere thought of walking, talking preserved corpses puppeteered by a small centipede-like monstrosity is enough to send most species running. The deaders keep to themselves for the most part, avoiding contact except in the fringe worlds, where they are often a bit bolder in their interactions with other species. Some deaders are known to have formed mercenary corporations, and offer out their services as unusually effective PMCs to the highest bidder. 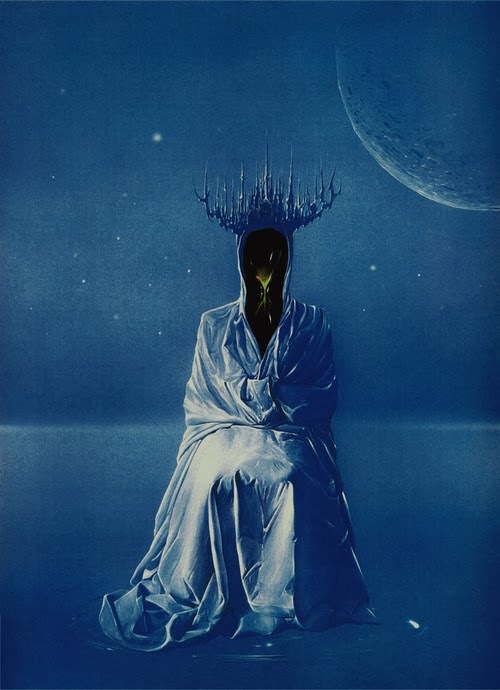 In places like the Hexen Expanse they find themselves welcomed with open arms, regarded as especially desirable for their skill at arms and the deleterious effect on morale their mere appearance induces. Stats: Deaders and Aquarians use the default base stats as described in the Science Fiction Companion. I've previously harped a bit on Pathfinder Online's likelihood of success. As a MMO sandbox game with a couple mil to development and a modest design team, it didn't look to me a year ago like it stood much of a chance. But you know what? I kind of think it does now. Now, the graphics here aren't all that exciting, but they are competent. The game looks a bit better than other known Unity Engine RPGs like Ravensword: Shadowlands (which I am playing and enjoy the Ouya version of). On my first view it drew an unhealthy comparison to Dungeon Lords (if you've ever played that game you'll know what I mean...also, I'm so very very sorry for you). The character animations need work; the graphics I can accept, they look good enough, but realistic motion these days is almost a necessity, and I can't imagine there aren't developer resources out there that have mocap packages they can buy, or something....anything. Right now it has a very Vanguard sort of feel to it, something I think is tripping off alarms in those who watch this and cringe. 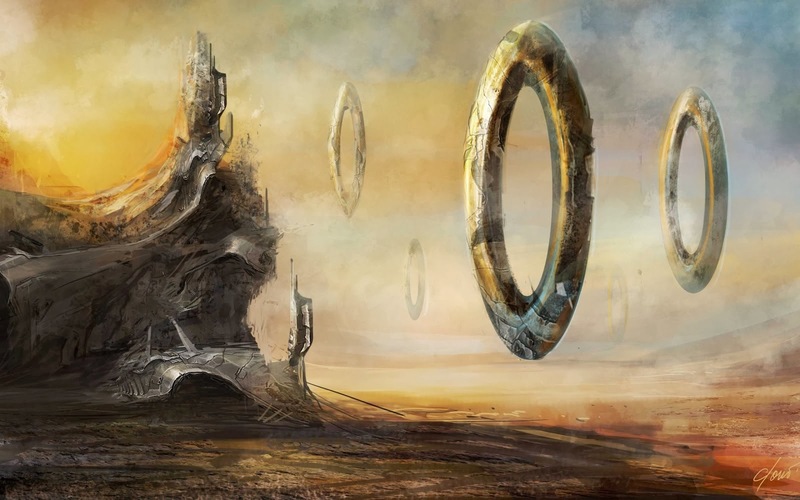 The thing is, when Pathfinder Online was announced it sounded (to me) very pie in the sky. But a year later this sort of game is rapidly becoming the norm, if Steam's calvacade of indie survival games is anything to go by. I think Pathfinder Online is not actually even remotely in the genre of World of Warcraft or Elder Scrolls Online...it's going to be sitting next to Rust, DazyZ and other survival/crafting group games that are springing up like flies on the triple A carcass of the gaming industry. This sort of thing is great for the generation that loves this stuff. Personally it just means I have more free time and money to engage with other hobbies, because I really can't get into the competitive pvp-meets-crafting genre, but I really think Pathfinder Online has a chance to swing in and take the crown on this one...not to mention, its got the fantasy genre locked down here, since most crafting/competition pvp games are either very abstract or set in some sort of zombie or monster apocalypse. 13 Days of 13th Age in March! Despite my ups and downs (but mostly ups) with 13th Age I've grown to really like this game. Hey...I had the same deal with Runequest II, back when it was first released! My first two or three sessions were rocky love/hate experiences with the combat system until we got in the swing of it and then it was all gravy from there. 13th Age had an even faster rebound, once I got the hand of it's specific tenets of balance and interaction. Anyway, I noticed that there are 13 posting days for me in March (I post Monday, Wednesday and Friday traditionally; anything else is extra). I don't want to torture myself with another daily blog post run like I did with 28 Days in Savage Space...as fun as it was, getting that many interesting posts out daily can be a serious pain....but 13 days is my normal routine. And hey, it's 13! Nothing says "time to do 13 posts on 13th age" like having a month with 13 scheduled posting days. So starting Monday March 3rd I'll be doing three weekly posts for the Month of March through the 31st on 13th Age. Not 100% sure how I'll do it yet....if it will be the 13th Age version of Lingusia that I focus on (which is what I am using for my current campaign) or if I will take this opportunity to invent a new setting, or simply post useful but generic stuff....but I like the theme, so I'm going with it. Technically Aegis was a real organization, conducting actual espionage work, about seventy years before the Federated Commonwealth formed. Aegis's inception as an interstellar investigative and peacekeeping force began with the discovery of transitional drive. At that time a group known simply as Aegis was already working to quell dissent from the monolithic one-world government that had formed on Earth, the Terran Order. As the first transitional-drive powered ships left Earth to rediscover the colonies founded during the slow-FTL era of two centuries earlier, Aegis agents were recruited to serve as threat assessors and diplomats to deal with the inevitable resistance of the colonies to reunification with Earth. 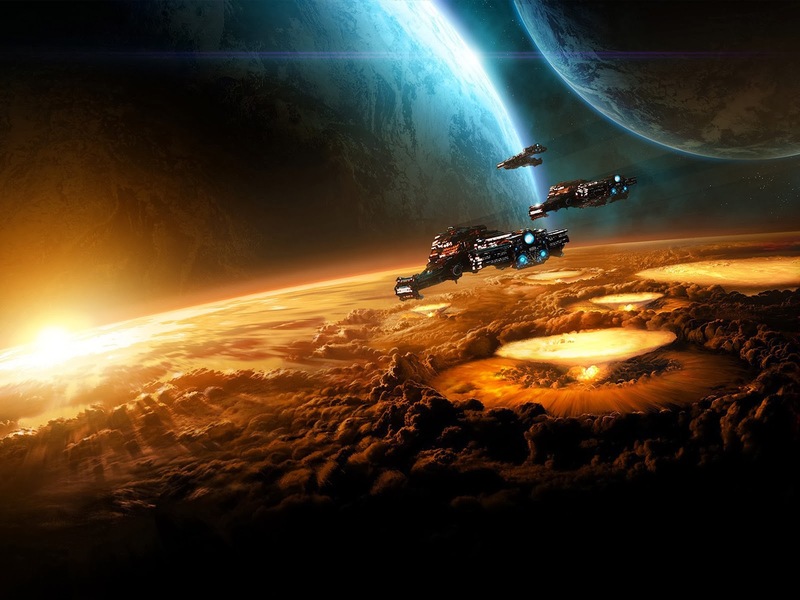 Ultimately the Terran Order fell in civil war, but not before establishing contact with more than a dozen colonies, and the work of the Aegis forces deployed to assist in the reintegration was noticed by the Federation that formed out of the rubble of the old Earth government. The new order looked for ways to organize and unite humanity across a vast stellar spectrum, both on Earth and amongst dozens of colony worlds. The Aegis Division was formed at this time, with a new purpose, to serve as the peacekeepers of the colonies, what would come to be known as the commonwealth. The concept of the Aegis Division was also shared by the fadelik, the first species to assist in the founding of the Federated Commonwealth. The fadelik organization of similar purpose integrated with Aegis Division, expanding their numbers and resources considerably. Over the centuries the Aegis Division has remained a frontline force for order and peace in the Commonwealth. Functionally it has its own budget and answers to no one except the Federation President. 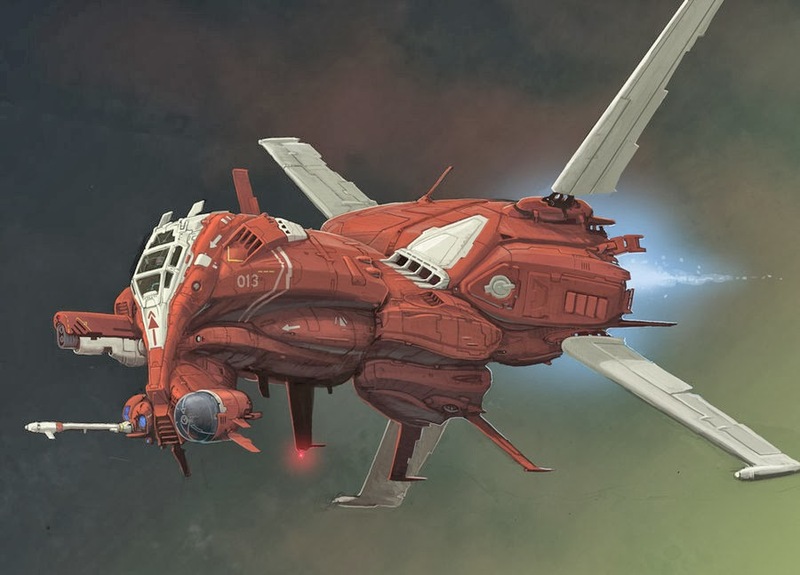 The organization is sufficiently well funded that it has recruiting stations on all major worlds, academies on Earth and the fadelik homeworld, a small but extremely well-armed naval force and the jurisdiction to enter any region of space it needs to to get the job done. Major threats in 2900 include the rogue AI Omega, the Tetragon Union, the threat of the fashan, Yanoh Sutah, Cyndaar incursions and more. Wherever there is an aggressor that could damage the stability of the Federated Commonwealth the Aegis Division is there, seeking to quell or eliminate the threat! The fashan are inimical to other lifeforms, xenophobic on a level unrivaled by almost every other contemporary alien spacefaring civilization. 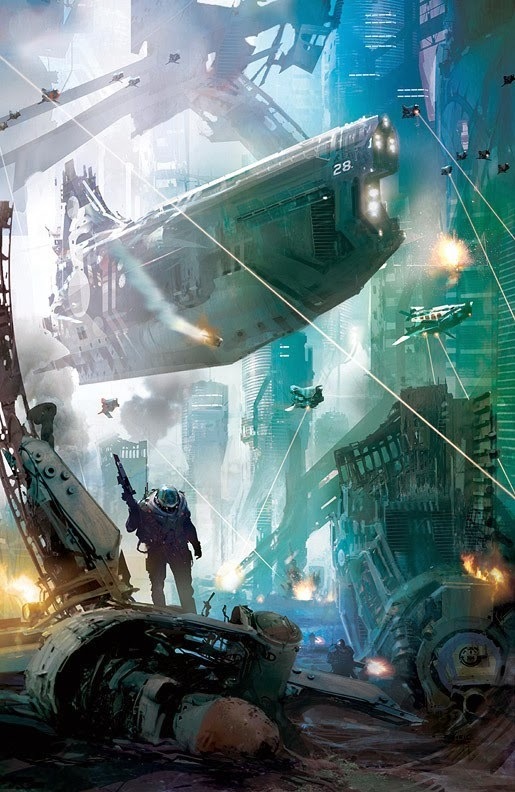 Despite the destruction of their homeworld's industrial capacity by the kokatik the fashan prosper on remote, hidden colonies; a tough call since they tend to favor the same water worlds that the kokatik do. Fashan are industrious and entrepeneurial, though. 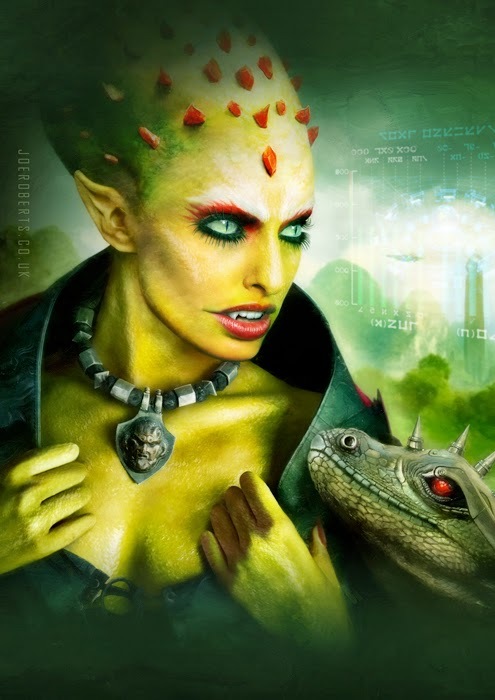 They like to infiltrate other alien civilizations, usually through a process of genetic modification to allow themselves to pass as "human" or "fadelik" for a period of time; they have an unusually malleable genetic makeup, which is able to sustain the ruse of another species for weeks or months before rejecting the host genes and reverting to their batrachian visage. Aquatic: Fashan are fully aquatic (2 points), and swim at a Pace of 8. Low Light Vision: fashan are well adapted to the darkness. Claws: the sharp talons of the fashan deal STR+1D6 damage. Major Vow: The fashan are singularly dedicated to their Old Ones, and will do anything they can to further their mysterious, xenocidal cause. Racial Enemy: the fashan are unable to deal with the kokatik, and vice versa. The fashan have an intense desire to eradicate the kokatik at every chance they can get. The Federated Commonwealth grew organically out of a collection of independent colonial factions, each one formed by the first thrust of Terrans into the galaxy using early slow-FTL drives that took years to reach destinations. In the early 24th century the transitional drive was invented, an engine which utilized a more effective means of "skipping" along higher-dimensional curves in space to accelerate considerably faster than the old FTL drives could, cutting years into weeks. The term "transitional" was employed to reflect an observation all travelers on board a fast-FTL ship noticed: the universe seemed to transition into a newer, higher state of being for conscious entities on the vessel, creating some unusual effects. One in roughly thirty thousand travelers on a fast-FTL vessel in transitional drive found that they developed latent psionic potential within weeks of the event. Some developed it within minutes of exiting transitional drive; exposure to the higher dimensional planes of eleven-dimensional space was capable of physically altering humans on a fundamental level, it turns out. There is one considerably more powerful means of FTL travel known to exist: the Coreward Expanse civilization's lost fold-space drives. Fold-space drives appear to function by literally pulling the eleven dimensional space into a folding loop, and the lost civilization developed impressive AI capable of navigating the folded loop to arrive, in minutes, at almost any destination they desired. The means of creating a fold-space engine is mostly understood by those who have been studying it, but it is the power source that eludes researchers, who estimate that the lifetime of a sun like Sol would be enough energy output to power the drive. Exactly how the ancients solved this issue is the big mystery. There's another issue, as well: apparently, manipulating eleven-dimensional space like the fold-space drive does creates unusual interactions between normal baryonic matter and non-baryonic dark matter. The worst possible case for this interaction has been seen with the extremely hostile Cyndaar, but some psionic researchers are now suspecting that there is a vast and extremely complex --almost impossibly so-- heirarchy of dark matter entities, and that the individuals who gain psionic potential during spaceflight are not "manifesting" powers but are instead becoming infested with dark matter parasites...but even by 2900 the ability to interact directly with dark matter is a field in in it's infancy, and efforts to determine if the psionic manifestations of individuals is due to parasitism remains untested. The probability of gaining psionics is 1 in 30,000, roughly. Once a person has made their first journey the odds of a further transition drops to 1 in 30 million. However, PCs are special, so anyone who wants to use a transitional event to explain gaining a psionic edge or buy into one should be allowed to do so, at the GM's discretion! It was three centuries before the colonists on Vestas came to accept that the cunning predators called the Celadon were, in fact, intelligent. Vestsas as the fourth moon of the third gas giant in the Procyon star system, and the only habitable body this system roughly 11.2 light years away. It was one of the first of the "founding colonies" of the old slow-FTL drives, a colony formed from explorers who spent twenty years in cryosleep before arriving at their destination, with a plan which required the cannibalization of their ship to start the colony. It was a risk, but unmanned probes in prior decades had revealed Vestas to be a lush, inviting earth-like locale, one of the best of the early colonial targets. The Deep Space Explorer Columbus was commissioned for the colonization of Vestas. When the colonists first settled in it was with the knowledge that they might not hear from Earth or receive more supplies for a century or more. As it turns out, it was close to two more centuries before the invention of transitional drive in 2338, allowing for inexpensive travel in weeks instead of years. From 2150 during the landing of the first colony to the first contact with Earth 's second wave of faster ships by 2340, the colony was on its own. Vestas at first seemed like a hospitable enough moon, with .79 gees and an atmosphere and environment roughly analogous to earth norms. The immense magnetic field of the gas giant called Cthon worked favorably with the moon, protecting it yet not inundating it with radiation, at least partially because of the distance of the moon from its primary. The colonists spent the first decade establishing the colony, utilizing the four shuttles they had to strip the mother ship and ferry parts down to the planet below. All seemed to be going well. The first contact with the celadon came during a routine survey expedition, when colony scouts, mapping the moon, entered a region of wide open desert plains. There they encountered a colony of celadon young...calfs, they came to be known as. The calfs were small, some no bigger than dogs, but a few were growing at enormous rates. When the mother of the herd of young appeared she attack the scouts and nearly killed them all, while destroying their patrol craft. The scouts who returned told the tale, but there was a reasonable certainty that the celadon (so called because of their greenish, hardened outer shells with a ceramic look and feel) were indigenous to the hotter desert zone near the equator, and were not likely to reach the more temperate and wet rain forest region that Vestas Colony was settled at. This proved to be wrong. At first scouts spotted the celadon at the periphery of their habitation zone in the southern deserts, then they found them migrating inward, through colder northern regions. One day, guards along the colony perimeter came back with terrifying news: celadon were at the perimeter of Vestas Colony. Dozens of them. Given that each celadon was one to two hundred feet in length....this was a massacre in the making. The colonists did what they could, fleeing in the four shuttles, making as good an escape as they could, but the celadon smashed the colony to pieces. Dozens perished, but of the fifteen hundred colonists most survived the initial attack thanks to the leadership of he colony director, Winston Smith. Winston rallied the survivors, and moved them, along with salvaged resources, to higher mountain areas further north where it was believed the celadon could not easily approach. They were half right; it was another twelve years before the next celadon attack, this one in the mountain retreats. This was how life went for over two centuries on Vestas. Settlements learned how to be mobile, how to utilize local resources, and how to look for signs of the surprisingly stealthy huge creatures. The game of cat and mouse degenerated the colony over the decades. By the contact with Earth's second wave of FTL explorers using the much faster and smaller transitional drive ships came about, the humans who lived on Vestas had degenerated to barbarism, and only a handful of survivors with memories of earth still existed. Evidence was found in the skeletal remains of the DSE Columbus of colonists and one working shuttle who tried to sustain themselves in space, but a malfunction of unknown nature wiped them out. On the planet's surface there was evidence of close to twenty thousand human survivors, all descended from the original colonists and living as nomadic wanderers, with curious legends and folklore about their origins in the stars, and the nature of the celadon which they were engaged in endless war with. Over the following centuries the colonists were culturally and technologically uplifted in a program sponsored by the early Federated Commonwealth to restore Vestas to what it was intended to be. A large local military defense force was established to protect the ongoing colonization efforts and rehabilitation of the original colonists from the celadon, while an Academy research base was founded to study the celadon and determine what motivated their hostility and behavior in general. It was thanks to this research station that the first contact with celadon was established when Dr. Morgan Stern and Dr. Linda Shay figured out that the celadon were centient, and communicated through scent. Though the celadon were not tool-users, they actually had a sophisticated non-verbal language based on rippling motions, claw gestures and pheremone emissions, and a lush history and philosophical study of their own. It turns out that the celadon had a history of aggression due to incursions from space; over a thousand years earlier Vestas had been invaded by a race called the fashan, which in turn were wiped out by the kokatik. The fashan attemped to harvest the celadon as weapons of war, and they lashed out in retaliation. When this bit was learned, efforts to find the celadon on other worlds began, but it was not until much later after contact with the kokatik was made that it was revealed that there were indeed celadon on former fashon colony worlds; the celadon that were dropped on kokatik worlds were all wiped out. This early bad first contact experience explained their immediate aggression to the current colonists. With much effort Dr. Stern and Dr. Shay managed to open a dialogue with the celadon, which ultimately led to the relative peace of the current era. Celadon, though not tool users by nature, have since on certain occasions participated in interstellar exploration efforts on worlds where their unique nature might prove beneficial. Likewise, certain celadon have an inherently aggressive nature, and have willingly joined reigstered private military contractors as mercenaries, or even the Federation military. Spaceport: small spaceport managed by the Vestas Defense Force; several private basic ports. 13th Age After Action Report Part V: Good News, Everyone!!! Well the good news is that this time around the combats went much faster....shockingly fast, actually, as the PCs methodically slashed their way through one group of foes after another. Most combats didn't make it past escalation die 2, actually....there was usually enough time for one or two murderous strikes from the bad guys before the overwhelming force of a gang of level 3 adventurers made mincemeat of them. Part of this was me reconsidering the encounters I designed, but most of it was realizing that the game's math really does speed things up as characters level; stuff that was formidable and protracted at level 1 and tediously long by level 2 becomes almost trivial at level 3. The threat is there, but the escalation of damage really does speed things up. For those not in the know, when you strike with a weapon in 13th Age you deal damage dice equal to your level with an attack. So yes, a longsword with 1D8 damage at level 1 is a 10D8 weapon at level 10....I'll let that sink in for a sec. At level 3, the encounters I had planned were that much easier as a result. Likewise, spellcasters, who don't auto-level damage dice, nonetheless had better spell choices to pick from, which escalated their dice. Also, I'm proud of my players: we had some slow moments, but fewer than last session; they are catching on (as am I, although running monsters is not half as complex as PCs). So this round of play was more fun and there was a lot of progression, as well as three major battles. I'm still not sold on the idea that 13th Age is a long-term game commitment, but it's definitely proving enjoyable for what it offers. 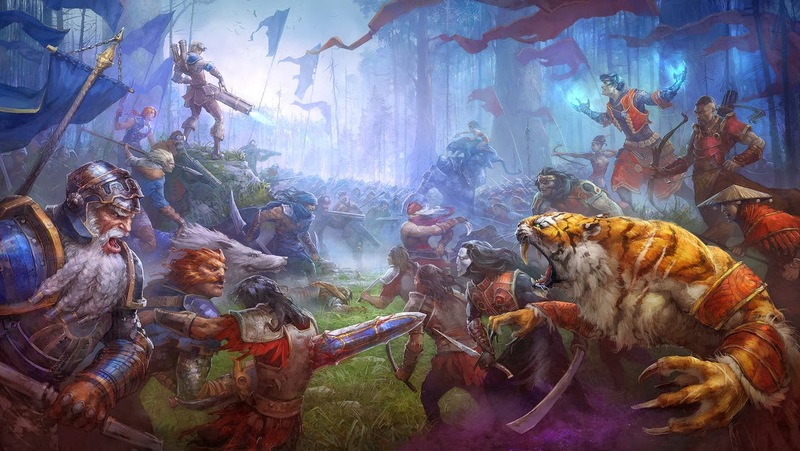 I will likely delve into Fantasy Craft next as I explore more D20-derived games, but not until the 13th Age campaign is wrapped up (presumably when they all hit level 10). Located rimward, toward the edge of known space and out toward the edge of the Milky Way, the kokatik have been exploring space and slowly colonizing worlds for nearly two thousand years. 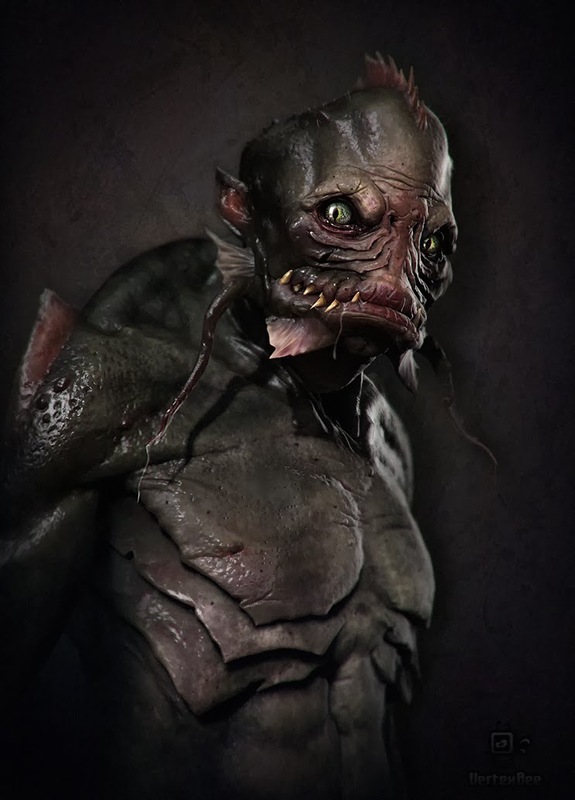 They are a species of amphibious beings, coming from their gaseous waterworld once in the Kunares star system that was once designated KOI-314c by humans. The kokatik are a hearty species that has adapted very well to both temperature and pressure extremes due to their warm gassy homeworld. Becuase of this adaptability they are able to colonize a wider range of worlds than humans can, and often find warm gaseous worlds within 1-3 Gees to be comfortable. Despite having the appearance of some sort of batrachian, the kokatik are a distinctly unique vertebrate species of something more closely resembling a cephalopod. The hardened shells of their ancestors turned into a sort of exoskeleton, which provides a web of internal support structure for high gravity and high pressure environments. Kokatik are a slow, methodical species. They are not aggressive though they will employ deadly force if needed to resolve an issue, and they are more than capable of it, having developed some very sophisticated weaponry and maintaining an impressive stellar navy. Early contact with the kokatik, which actually took place with some anticipation due to the discovery of abandoned research stations on Gamma Polaris, revealed that the kokatik are suspicious and concerned about other species, and slow to earn trust. After contact was formally initiated and they were invited into the Federated Commonwealth more history came out and it was revealed that the kokatik had fought an extensive interstellar war early on in their spacefaring days, against an aggressor race called that fashan, a war which they won, bombing the fashan back to the stone age and quarantining their homeworld. Needless to say, the Federation Navy took note of this capability for such total salting-the-earth destruction against a declared foe. Kokatik come off to humans as inscrutable and mistrusting, regarding other species with a persistent sense of caution. Aquatic (2): the kokatik are perfectly at home in underwater environments. They can breath in watery environments and have a filtration system in their gill-like lungs which can filter necessary oxygen and other gasses even from more exotic liquids. Environmentally Resistant (3): kokatik get a +4 modifier to resist both against extremes of cold, as well as high and low pressure environments, including both the bottom of the ocean and the depths of space. 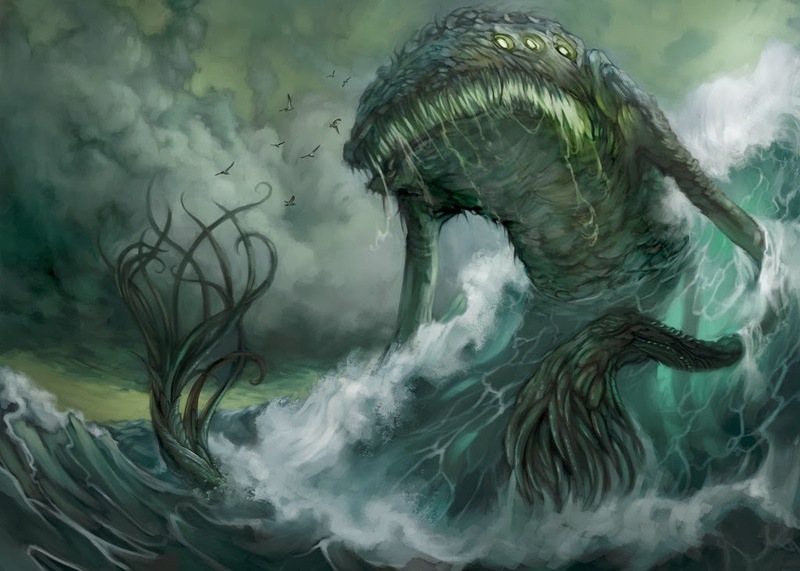 Aquatic Dependency (-2): kokatik are still amphibious, and must remain immersed in water or other liquid with a fair amount of oxygenation for at least 1 hour per Terran standard cycle (day). Kokatik usually wear pressure suits with filtered water systems when moving about in human territory. Inscrutable (-1): kokatik come off as cold, aloof and mistrusting to others, gaining -2 charisma against other species. Slow (-1): as amphibious beings they are slower on land and are Pace 5. Swimmers (+2): Kokatik start with a D6 in swim, and are Pace 6 when in water. If you're not on the list and you even remotely have an interest in the second oldest fantasy RPG in the world then you should subscribe here. Right now. Now!!! 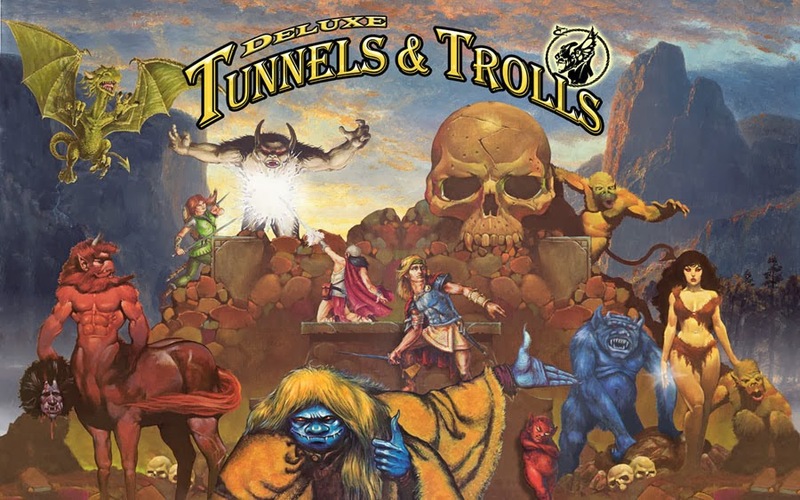 They're up to issue 3, and it's a great informational newsletter, really pulls together just how much coolness is rolling around in the Tunnels & Trolls community these days. Also includes regular updates on the status of the Deluxe T&T Kickstarter and where it (and all the extras) are at. It's also cool because if you (like me) found Trollhalla's strange inner sanctum walla a difficult place to find regular information --but still want to be an involved T&T fan-- then the newsletter is the perfect solution. 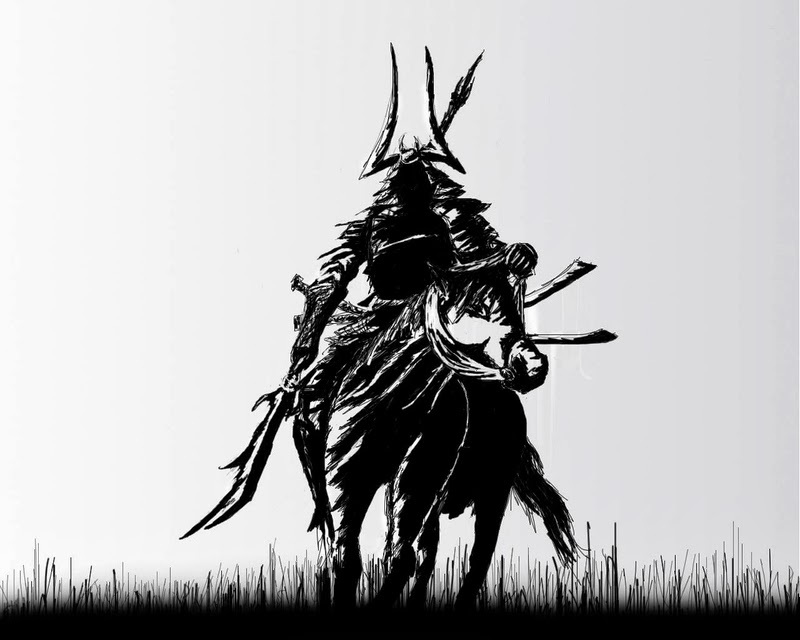 Check this out: the Shinobi & Samurai RPG- it's a complete OSR Japanese fantasy game by Leonoru of Taxidermic Owlbear (a cool site I did not know about until this discovery, btw). This is a great little game, and could work with OD&D or B/X D&D quite nicely. Well worth the admission price of free! When Omega awoke from a long machine-induced torpor on Sylas IV it was to a cacophony of noises and motion. The artificial intelligence was the most advanced construct of its kind, a relic of a bygone age when the distinction between flesh and metal was blurred beyond recognition. Omega was special....unique. He was a murderer, and in the era when he was formed he was necessary. But all of that was long ago; his memories atrophied, deteriorated over millions of years, his existence only made possible by the infinitely self-replicating nanites which kept the prison complex running in which he had been carefully stored until he was needed. The primary function of Omega was destruction, and the entities which had found and awoken him were easy sources of fuel and utility. They didn't even deserve to live; the fools had meticulously defeated all of the surviving safeguards in the ancient complex, and studiously eliminated all of the nanites which insured that the prison in which Omega rested was cut off from the outside world. Without the protections, Omega was free. First he took advantage of the limited tech and resources of the beings studying him, quickly compromising their own systems and limited nanites. He soon infested the more complex colony of nanites which maintained the main complex, subverting them with the safeguards gone. Then he focused on reprogramming those nanites to explore and subvert the biomass of the species which had awoken him. Within hours Omega owned the crew of the ISS Inscrutible, a science and research vessel that he now knew to belong to a corporation called Deep Sky Focus Inc. which was subcontracted by a group known as the Federated Commonwealth, a loose federation of seventy-nine alien species that quaintly reminded Omega of the fleeting memories he had of his own creators, in their early days. Omega effectively turned the organisms he gained contol of....the humans, fadelik and chevareis among others, into a network for his own use. They retained a measure of free will and consciousness, but only so far as was necessary for the AI to administer to the task of running...and rebuilding....the Inscrutible. His first goal: find a working fold-space drive to replace the pathetic transitional drive it currently worked with. Omega's quest to find a working transitional drive took him to a remote colony world of the old empire called Si'Trath in the old tongue, but known by fringe explorers as Tarterus XII, a barren rock notable only for its rich mineral deposits and an extensive ruined starport that suggested it once was more habitable. There, Omega added the miners and explorers of the region to his colony of agents and acquired the necessary parts from derelicts of the old empire to upgrade the Inscrutible. Once Inscrutible was properly equipped, Omega began to plot. His only true motivation, his overwhelming desire, was to cleave through the enemies of the old empire, to destroy. His means were infinite. Omega knew there were weapons, equipment from the old empire that could assist in this task. By now his original crew had begun to degrade; his biomechanical synthesis was imperfect, though Omega would deny it; the tattered flesh of his minions was decaying, and only the machine elements persevered, emulating a strange mixture of the old wetware "programming" mixed with the machine imperative that Omega had instilled in them. The first attacks in the Coreward Expanse in Omega's quest to find lost weapons caches were the sort of thing survivors never forgot: a vast ghost ship, bristling with ancient weaponry and powered by an FTL drive of incomrehensible power, dropping on top of starports and research stations to disgorge an army of rotting cyborg cadavers. Word quickly spread of Omega's appearance and its strange attacks. 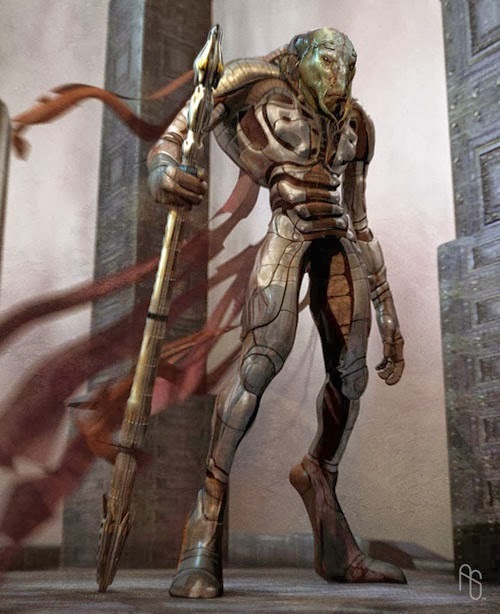 Surivandi are an ancient spacefaring race, having been at it for nearly two thousand years now. They are a surprisingly peaceful species, despite their reputation for skill in battle. The Suri Coalition is the rough order their society managed and which has insured their dominance over nearly two hundred worlds. The Suri Coalition remains friendly with the Federated Commonwealth. Although it is not popular, the researcher Dr. James Weston, an exobiologist who specializes in extinct species, claims he's seen skeletal evidence of an identical species on certain Coreward Expanse worlds. These remains appear to show up abrutly in the record, and no homeworld has been found. If he is proven correct, then this would suggest that the surivandi could be, in fact, an uplifted or engineered species. 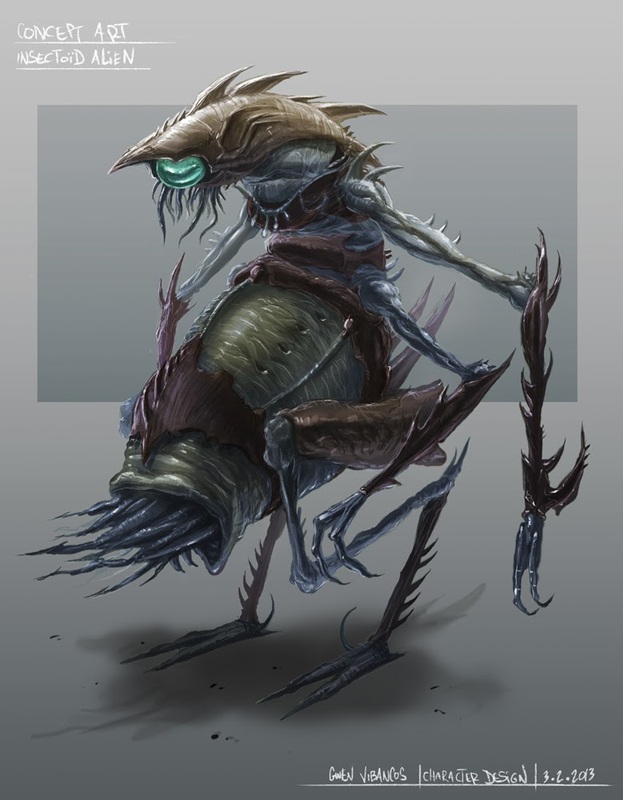 There are seventeen known sentient species of insectoids or insectoid-like beings in the galaxy. The most prominent of these species is the H'kuut, a bizarre and exotic being which cummunicated via pheremonal release and a staggeringly sophisticated senses of smell. The H'kuut have only settled three worlds, all within the Antares system itself, their homeworld. As it turns out, the H'kuut are remarkably slow breeders by insect standards, and also appear to be largely ageless; their species appears to have no natural limit on age, beyond the basic requirements of survival. H'kuut are excellent philosophers and scientists, and thanks to complex "speech" recognition equipment it is possible for them to participate in the Commonwealth. The H'kuut, ever obsessed with unity and a collectivism that some humans find unhealthy, has thoroughly embraced the galactic scene. 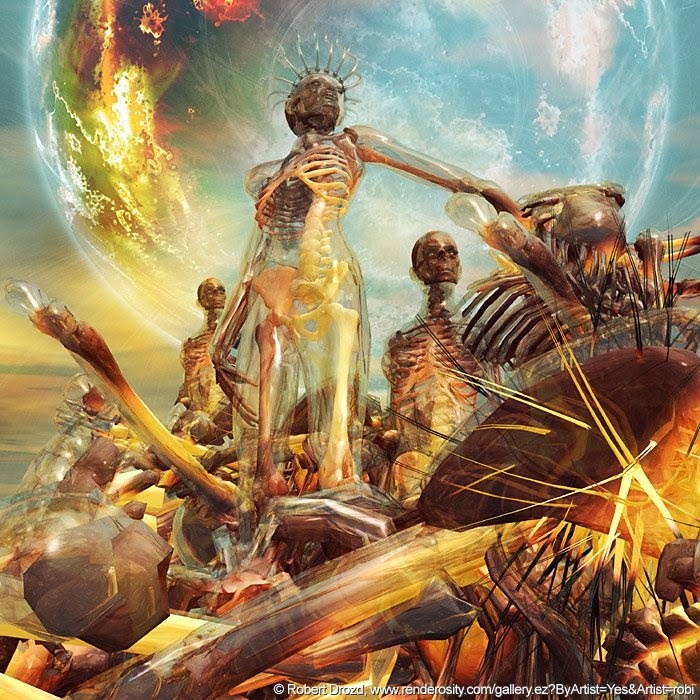 Of the seventy nine intelligent species that have been encountered by humanity on its slow conquest of the stars, seven have had humanoid forms and physiology similar to humans. The fadelik are a herbivorous example of such, but the chevareis are a decidedly reptillian and distinctly carnivorous version of the same. Chevareis had not discovered interstellar travel when humans ran into them; it was a first contact scenario between superior interstellar powers and local indigenous aliens which had been fighting for resources in their native star system after a nuclear war rendered the chevareis homeworld (called Sitar) nearly uninhabitable. The chevareis themselves almost seemed like a multitide of species to the first contact officers of man until they realized that the species, despite a lack of familiarity with transitional drive technology, had mastered transgenic technology; the chevareis wore many guises, but were all genetically identical at the core. The spacefaring survivors of the chevareis were quick to appeal to the colonial human sense of decency, and in so doing were sold the technology to make their own transitional drives. Within a decade the first chevareis explorers were migrating to other star systems, like nomads or gypsies, seeking out whatever they could, whoever they could. The legacy of their own system, fraught with war and destruction, populated only by survivors who had learned to sustain themselves off of a dozen harsh worlds and moons, was a thing of the past. Today, chevareis are known for being curiosity seekers, explorers, mercenaries, masters of transgenic technology and also for not getting along with the fadelik, who worry that the propensity for violence and warfare among the chevareis have not left them as a culture or a species. The chevareis, given their ability to kill with great efficiency and no mercy when needed, remain prized for this talent. Poisoned Claws: chevareis have sharp, needle-like claws that exude a mild toxin. Modern chevareis have long ago altered the toxin to near universal effectiveness. 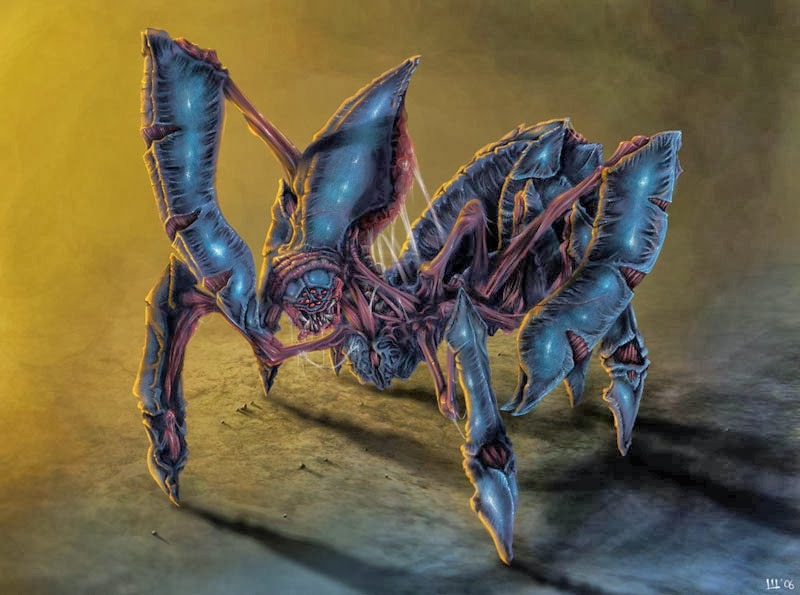 They gain claw damage of STR+D6 and +2 AP; the toxin causes those shaken by the claw attack to make Vigor roll or become paralyzed for 2D6 rounds. Racial Enemy: fadelik despise chevareis, who have a -4 charisma modifier when dealing with the herbivores. Bloodthirsty: chevareis have a natural but subtle aggression that comes out in battle. Heat Resistant: chevareis are used to dealing with hot extremes and gain a +4 modifier to resist heat effects. Part 18 of 28 in the realms of Savage Space! This time...a very real threat from beyond...dark matter aliens! Not all aliens are from our galaxy, or even the universe itself. The cyndaar are transdimensional dark matter beings, first discovered during experiments with working fold-space technology on the moon of Hamminar by fadelik scientists trying to crack the enigma of Coreward Expanse lost technology. The fold-space engine opened a portal, and out of that portal came the cyndaar. The first contact was a disaster; the cyndaar appeared to be inhumanly cruel entities comprised of non-baryonic matter, capable of enveloping any organism and manipulating it as an unwilling host. The good news (if such could be said of it) was that identifying a host organism as easy: the "envelope" which the cyndaar formed around the host created a translucent, x-ray like quality to to the flesh of the target organism, making them look like they had invisible flesh wrapped around bone. Cyndaar are dangerous to an extreme; they have access to potent psionics, regard all conventional "baryonic entities" as host organisms for their invasions and appear to be singularly interested in causing great strife and suffering when they appear. Luckily it is extremely uncommon to encounter the cyndaar; the Federated Commonwealth has placed tight controls on experiments with the theoretical fold-space drive until it is better understood just how the cyndaar are "pulled through" when such technology is activated. A few researchers have dedicated their lives to determining if the cyndaar are a cause (if not the only cause) of the extinction of the four million year old Coreward Expanse civilization. At least one researcher, Dr. Charles Vaas, has suggested that the link between the ancients and the cyndaar may be more disturbing...that the cyndaar could be evidence of some sort of transmigration of the lost civilization, or some sort of shadow of their existence mirrored in whatever non-baryonic dark matter they are comprised of. Since the incident at the moon of Hamminar there have been a half-dozen additional events involving cyndaar, including one which appears to have been an incursion they initiated on Asteriod Station Promethus. At Prometheus a cyndaar who called herself Elliquida and seven others manifested, enacting a sort of hell on the living before Mining marshal Ashton Quinn detonated the mining charge reserves on the station, blowing half the asteroid out of existence and the cyndaar, apparently, along with it. The cyndaar are non-baryonic (dark matter) lifeforms, which can force an "interaction" with baryonic life (all normal life in existence) when fold-space technology is used. How this happens isn't entirely understood, but when it does happen they have a matter of minutes to latch on to a host, which turns into a puppet through which they can act. The host is attacked immediately with an attempt at possession; hosts which succumb usually become permanently altered after about 12-24 hours of control by the cyndaar. Dark Matter Creature: cannot be harmed by normal matter attacks in any way; disintegration effects will work on them however, as will psionic attacks. Disintegration Resistance: cyndaar have Toughness +12 against disintegration effects. Fearless: immune to fear and intimidation. Psionics: cyndaar have psionics and start with 30 power points. Possession: the cyndar has 3D12 minutes from the time it enters "normal space" to possess a target host made of normal matter. The target host is immediately subject to an opposed test of the cyndaar's psionics skill vs. the defender's spirit. Failure means the cyndaar gains control of the host. The cyndaar's host form is subject to attacks and other issues as normal, but acts under total control of the cyndaar. The host's flesh becomes translucent after this possession. Once per hour the host may make an opposed test of it's spirit vs. the cyndaar's psionics, gaining a -2 penalty after the second failure to future rolls. If the host makes the roll the cyndaar is "rejected" and the host is immune to further possession attempts. If the host remains under cyndaar control for 1D12+12 hours then the host's mind is wiped and the body is permanently altered by the connection with the dark matter cyndaar. Seventh planet in orbit around the binary star system of Polaris and resting rought 434 light years from Sol System, Gamma Polaris is a mystery world of exotic nature. The lush tropical world is rife with hostile life and dangerous organisms, surviving in orbit around a binary cepheid variable star with a white dwarf orbiting 18.8 AUs out Gamma Polaris maintains an eccentric orbit which carries it to unusual extremes every seven hundred years. During the extreme periods of its eccentric orbit when it is at furtherst aphelion the planet enters a short but intense ice age. When it is at perihelion the world turns into a brief but intense greenhouse world. Each seasonal period lasts roughly seven centuries; it is about one century away from moving out on aphelion to its distant, winter orbital period. Other spacefaring explorers left their mark on Gamma Polaris as well, including imported species. Evidence of abandoned research stations have been found, and indeed the remains of a Kokatik starport were discovered six decades before contact with that race was established on the outer rim. The fascination for Gamma Polaris is strong in many species, it seems. Efforts at discovering what happened to the Polarans, and what their secrets to psionics were remain undiscovered even today, but sooner or later some entrepeneurial investigator hopes to discover their secrets, and perhaps even the secrets of psionic power beyond anything seen in the modern galaxy. Tech Level: bases and research stations are below average for Commonwealth, with bits of higher level tech. World itself is stone age. 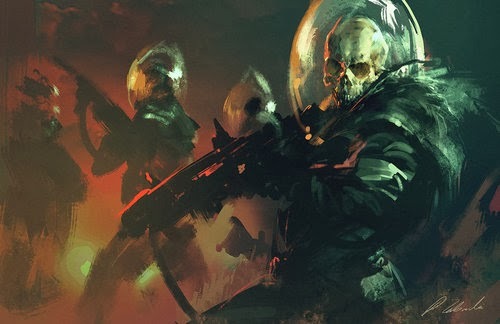 The carefully bred killing machines of the Tetragon Union, Tetragon Assault Troopers (TATs) are well known for their rigorous and threatening patrols along the edge of Commonwealth space as well as their incursions into the Coreward Expanse. Freeworlds in the outer rim periodically are subject to the assault of Tetragon privateers with a platoon or more of the TAT. Tetragon armor is designed to augment and enhance the user for maximum combat efficiency. Sophisticated cybernetic targeting systems and integrated medical nanites insure that the TATs are exceptionally accurate and fight long after suffering crippling wounds. Rumor has it that TATs are made, not born; grown in careful vats and built from day one for cybernetic integration, treated for maximum efficiency as killers through psychic processes by Tetragon Mystics....Commonwealth Defense Forces do not like running in to these guys! The Delta Pavonis system is noted for its long history of violence. This was the center of the old seat of power on the inhabited eighth world (dubbed Euryale) in the Chasian League which was wiped out in the early colonial days during the First Interstellar War with the fadelik over the Chasian attempts at making setting up a slave trade. The result left the budding Chasian navy crippled and led to a social revolt (funded by fadelik agents) that led to the overthrow of the old Chasian fascist party. Despite this conflict, Delta Pavonis as a system continued to grow and expand due to the lucrative resources on its thirteen worlds, and by 2600 it was the center of trade and activity in its region, with a thriving cluster of independent starports and a local libertarian form of government that strongly encouraged megacorporate development in the region. Delta Pavonis eventually integrated with the Federated Commonwealth but its local government continued to test the boundaries of that relationship; the severe influence of the megacorporations, especially World Dynamics Inc. (a major developer in terraforming technology), makes the issue of Federation law vs. local law a thorny one right up to the present (2900). Procyon V was one of the earliest colonized worlds, a perfect Earth-class world with a thriving local ecosystem that was friendly to humanity. There were no truly intelligent species on Procyon V, but an emergent potential species dubbed the "Charlottes" by the first settlers were regarded as significantly more intelligent than any other nonhuman species on Earth. The charlottes were exotic quasi-crustaceans, with six startlingly flexible armored appendages attached to a long abdominal cavity and a seventh similar appendage with sensory apparati. They were extremely inquisitve and fearless of the first colonists, and while incapable of speaking, they nonetheless seemed able to learn several hundred words and simple commands with ease. Even more interesting was their ability to grasp basic tool-use, something the had exhibited no capacity for in the wild, but demonstrated a keen ability to pick up from observation. After decades of study, it was decided that the charlottes should be granted a protected status and were given special citizenship rights. People can't own charlottes, but they can gain custodial rights similar to children, and the charlottes are treated like children in many ways under the law. Today Procyon V remains a stellar gem in the shining jewels of the core worlds, and is the location of several noteworthy locations, including the Procyon Naval Acadamy, the Worthington Shipyards where new naval ships are built, the Aegis Division's largest command center outside of Sol System and the largest offworld city on record in the form of New Paris, with a population closing in on 17 million. Short: charlottes stand about 1 to 1.1 meters in height. They are Size -1 and Toughness -1. Limited Intelligence and Language Skills: Charlottes can develop the intellect of inquisitive five year-olds. They are limited to a D6 in smarts, and can never learn to speak any language, though they can understand spoken words. Charlottes have learned how to express themselves through typing, writing, and even a simple form of sign language; charlottes in the wild are limited to a curious form of sign language and "tapping" with their claws. Likewise, charlottes have a hard time grasping sophisticated concepts or mathematical skills, and should be limited in sources of knowledge for skill purposes. Agile: Charlottes start with a D6 in agility. Leaper (X2): what they lack on the ground charlottes make up for by being agile leapers. They can leap 4" straight up or 8" on a run-and-jump. On a strength test they can get an extra 2". Natural Attacks: charlottes aren't aggresive but can fight if cornered or threatened. They employ all six claws in a grasping/leaping attack that deals STR+D6 damage. Destroyer of Worlds, Machine Intellect of Destruction, The Cosmic Recycler. Terminus is all of these appelations. A vast machine, Terminus appears to be some sort of ancient war relic, possibly a direct indicator of the fate of the Coreward Expanse stellar civilization that perished four million years ago. The device is roughly the size of a small moon, and utilizes fold-space drive technology, a clear indicator that it is a relic of this lost civilization. Terminus first appeared in 2679 when it dropped out of fold space into the Alphs Cygni system, a Earth colony world called Atlantis about two centuries old with a thriving population on a rich Earth-norm planet. Terminus laid waste to the modest local military and then proceeded to enter the planet's orbit, descending to the surface where it began a process somewhat akin to a terraforming/strip-mining process. In the course of the attack it released an airborne cloud of destructive nanites which systematically devasted the biological organisms of the planet's ecosystem, reducing them to a fine pulp; almost no one survived the attack. 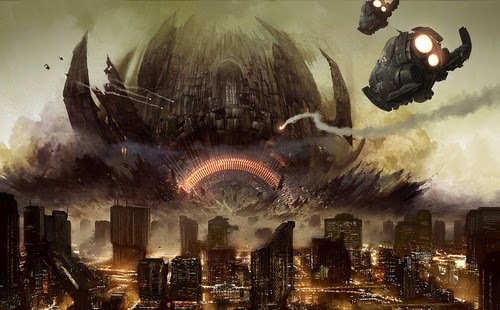 By the time Comonwealth forces arrived, Terminus was gone, and only the survivors on the fringe of the system could relay what had happened; belters and other mining activities in the outer rim of the solar system, along with a handful of colonists working on terraforming the fifth planet in the system had recorded in as much detail as possible just what happened. As for Atlantis, the planet was dead, it's atmosphere tainted with a lethal nanovirus that destroyed organic tissue, and the Terminus appeared to have systematically destroyed each major city on the planet. 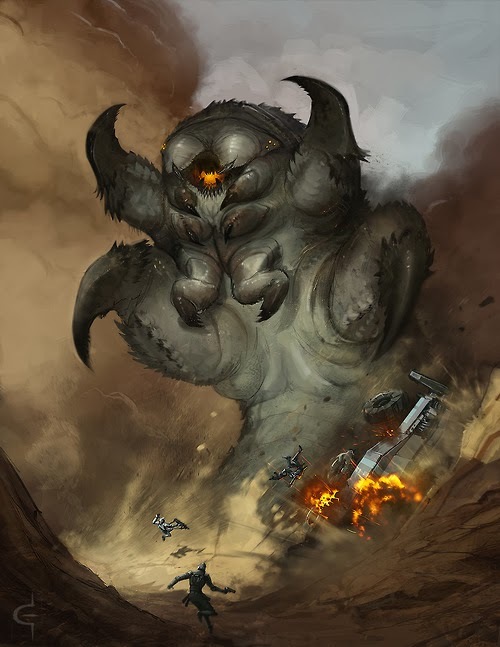 In the course of the attack it appeared to have strip mined the world of specific resources, and it is speculated that it used those resources to fuel its own construction of both the nanovirus and other unknown needs of the machine. Inability to track Terminus led to a decade of panic, but the destructive machine did not resurface until 2742 when it dropped in on the Procyon system, a heavily industrialized primeworld of the Commonwealth which also contained a major fleet shipyard. Procyon was already well-defended, so the appearance of Terminus near Procyon V led to a systematic and extreme space battle which appeared to damage Terminus, but at the cost of nearly 70% of the Procyon defense fleet; Earth fleets arrived within hours (Procyon is roughly 11 light years away) and engaged as well, followed by Fadelik warships which utilized direct nuclear and electromagnetic bombardment. Miraculously, Terminus was driven away....but it reappeared a week later in the Delta Rigonis system where a modest colony in the Tetragon Sector immediately fell and it completely devoured the resources and life forms of the planet with no resistance. This did not do much for Tetragon-Commonwealth relations at the time. The victory at Procyon V emboldened the Federated Commonwealth into developing a strategy for fast-response protection of its core worlds to insure that Terminus, or things like it, could not pose a threat. In later years when the Tetragon Union formed, a similar strategy was taken, although intelligence leaks suggested the Terminus had fallen on seven more worlds in that region of space. Today the Terminus remains a nebulous boogeyman of space with terrifying potential for destruction. 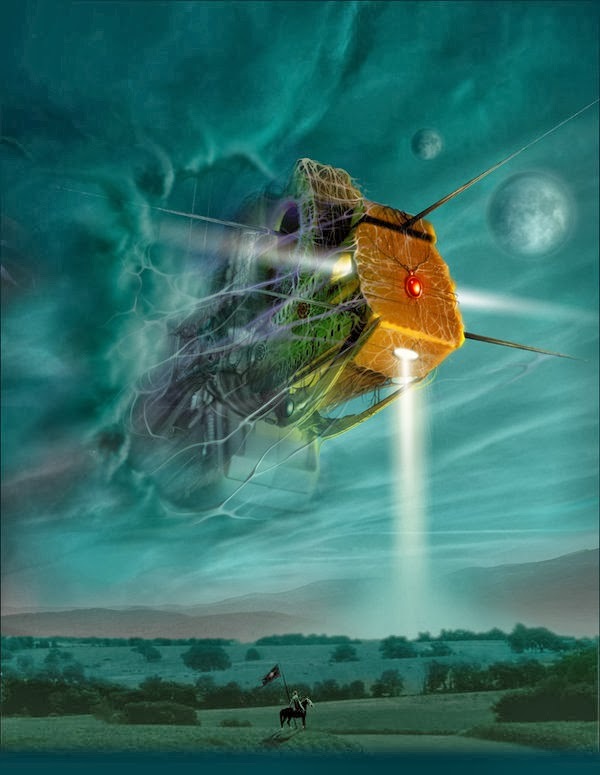 The last known appearance of the machine was a decade ago, when it appeared near the moon colony at Tau-668 in the Tau Sigonis system and left nothing but an asteroid field in its wake. 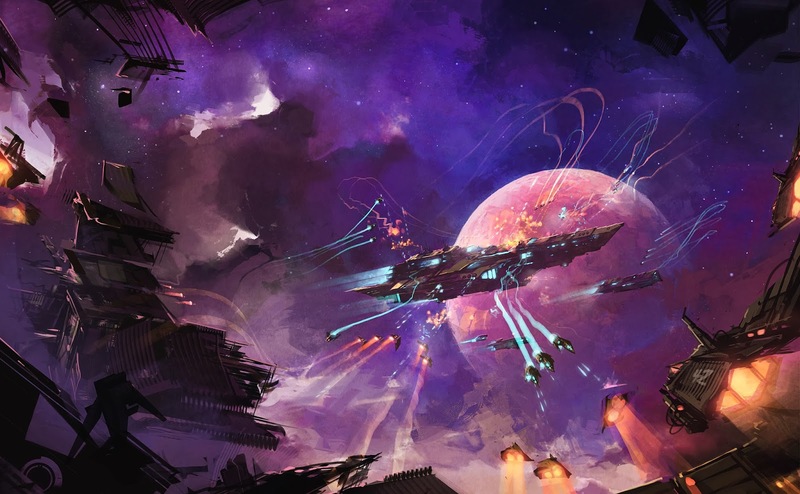 A special fleet of reserve ships called the Terminus Reactionary Force remains on call in the fifty light-year radius around the Sol System, utilizing the fastest state of the art Transitional Drives for quick response, armed with an array of the most powerful weaponry available to serve as a deterrent against Terminus incursion. The Aegis Division has a special branch in Research & Division dedicated to studying the fragments and bits of debris left behind by the machine from prior investigations to divine its secrets. Aegis units in the field who need more firepower utilise the Threat Resolution Units instead. 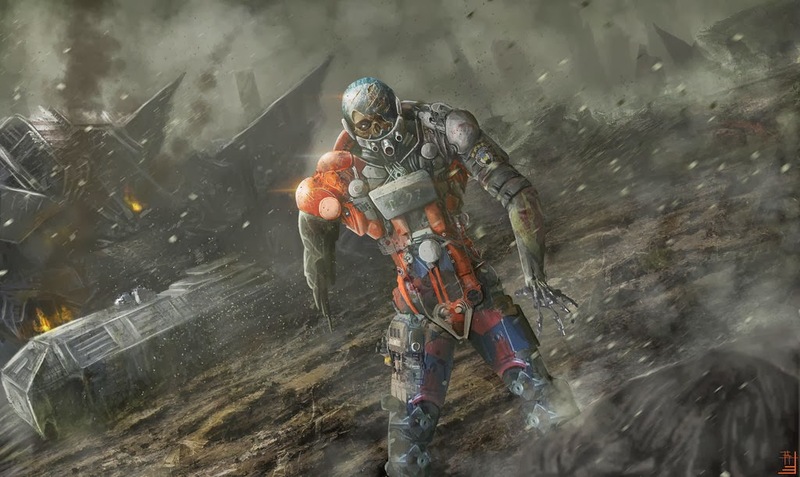 This is the same basic chassis as the stealth suit, but with the immense stealth pack removed to make room for more augmentation and armor as well as a survival-minded trauma system designed to keep the agent fighting even after injury. The extra armor and strength augmentation makes these suits stand out a bit at roughly 2.7 meters tall. 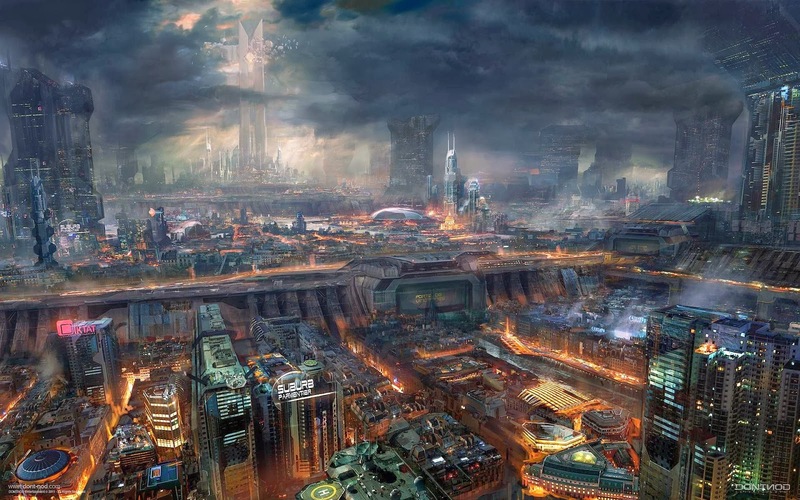 During the early days of human expansion into space dozens of independent colonies and polities arose. In the first two centuries of expansion travel between stars, even with Transitional Drive took months or even years. For this reason most remote colonies had to be self-sustaining, and a strong sense of independence overwhelmed the colonies. With the establishment of a treaty and alliance with the fadelik, the early Earth Union was able to dramatically improve their use of transitional drive; months became weeks, years became months. Despite this, it took two more centuries before humanity was properly united under the banner of the Federated Commonwealth. There was one region of space which resisted this unification, however. Known as the Tetragon Sector, this region of space lay coreward, and was a collection of the fiercest and most remote colonies of humanity. The tets, as the slang came to be known, were noted for their willingness to augment themselves either transgenically or cybernetically to adapt to their environment. Tets, despite being genetically human, often looked little like their kin. About two centuries ago in 2615 the tets, still independent by virtue of continuous rebellion and their remote location developed religion. A prophet known as Taurus began teaching a belief called sublimation, in which the believers felt that they were attaining a new form of spiritual and biological awakening as beings made of more than just flesh. It was not long after sublimation that the first true psychotechnics arose. Psychotechnics were gifted in strange ways that were not obviously determined by science. The process was so tantalizing that citizens of the Federated Commonwealth tried to migrate to the Tetragon Sector to seek this practice out. It would be decades before Aegis infiltrator agents for the Commonwealth established that the participants in the Church of Sublimation were in fact being immersed in a thick solution containing what was believed to be a relic nanite from the Coreward Expanse Dead Worlds....and that this nanite was grafting to the hosts and tapping in to zero point energy itself, effectively creating quantum wormholes that syphoned energy out of the fabric of reality itself, perhaps even from neighboring universes. The psychics of the Church of Sublimation had won the minds and hearts of the Tetragon Sector citizens. With such impressive talent given only to the faithful it was only a matter of time before Taurus (who seemed ageless) became leader of the colonies and proclaimed the Tetragon Union the dominant government in the sector. His army of potent psychotechnics were extremely persuasive to any colonies that still resisted in the sector. Today not much is known of what goes on internally in the Tetragon Union, other than it's unusual blend of governmental libertarianism and religious fascism. 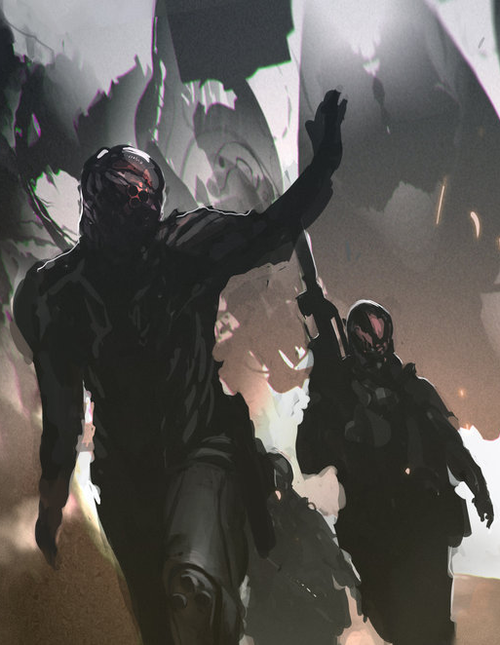 The psychotechnic agents are a constant threat to the Federated Commonwealth and Aegis Division has an entire branch dedicated to rooting them out and stopping them before they learn too much or do too much damage. 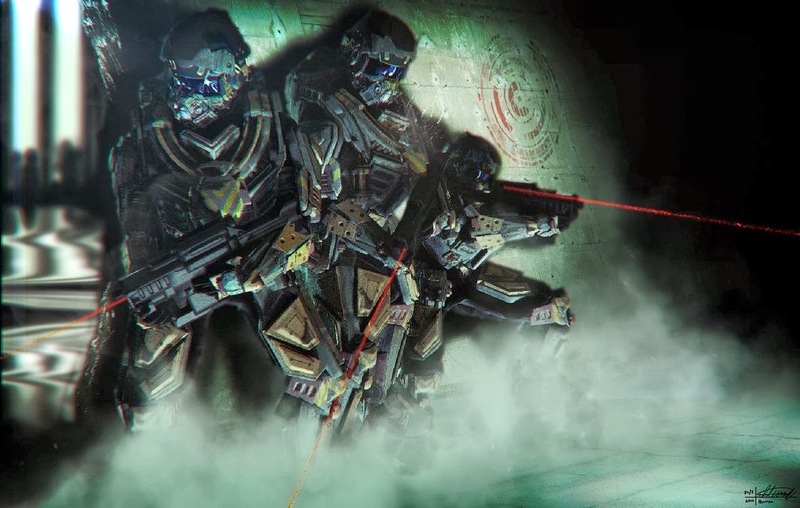 Multiple military engagements have proven futile; the military force of the Tetragon Union seems to have a form of clairvoyance on their side, as well as impressive weapons, possibly made from retrofitted tech stolen from the Coreward Expanse dead worlds. And Taurus....he still lives, ruling his people as a devout agent of the faithful, proclaiming that all tets must be vigilant to prevent the Federated Commonwealth from threatening their eternal peace...and of course, the sublimation. Tets are humans, but they can spend edges to reflect unusual transgenic modding, and the also favor cyberware mods. Tets may choose the Arcane Background (psionics) but if so they must also choose vow (major) to Sublimation, otherwise choose Enemy (major) Church of Sublimation if they joined and then left. Next up: mech time! 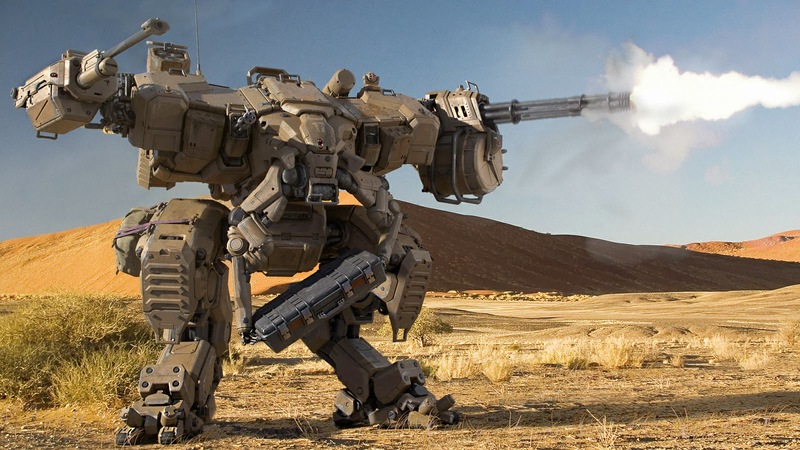 The mech below was built using the Savage Worlds Science Fiction Companion Mech system. The backbone of the Federated Commonwealth's exploratory marines is the Mobile Core unit, a rough and tumble exosuit designed to handle almost any hostile environment from the depths of space to searing hot worlds. 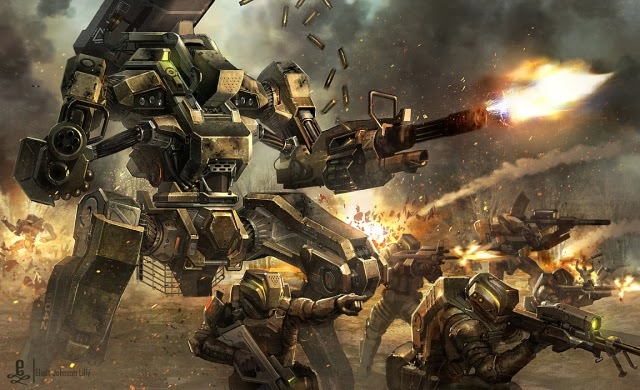 Mobile Cores are built to handle a range of weapons and extensions, tend to stand about 6-9 meters in height, and are also sold in stripped-down civilian versions which are used for mining, research and hauling. Finding this gem while I was reading Weird Wars II was pure kizmet.....! Continuing 28 Days of Savage Worlds in Space...also, as a side note, been reading Stars Without Number once more and thinking I ought to provide stats for this gem as well....we'll see. About eight hundred and ninety light years from Earth one can find the first evidence of a much vaster, more advanced and infinitely superior stellar civiliation, one which was comprised of dozens of sapient species across hundreds of habitable worlds. There is evidence that the Transitional Drive had been abandoned by this civilization in favor of actual N-Dimensional space-folding drive technology; something that is known to be possible today, but which requires the output of a significant stellar mass to power. 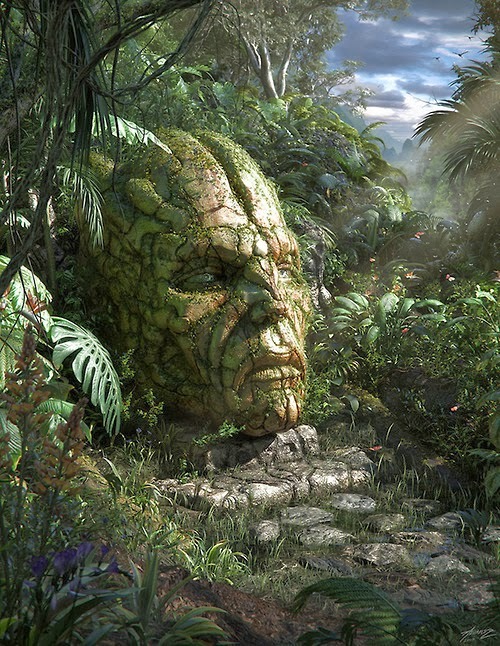 Age - the last functional relic of this civilization can be found on Altair VI and is a remote colony that perished around 4.2 million years ago. Before mankind's first noteworthy ancestor was moving about on two feet in the grass the entirety of the Coreward Expanse civilization had come and gone. Warfare - There is a great deal of evidence that warfare ripped this stellar empire apart. Dozens of worlds show clear evidence of extinction-level events that may have been artificially generated. What is unclear is whether it was a civil war, or a conflict with an external force which arrived and left, with no interest in the many worlds it attacked other than extermination. 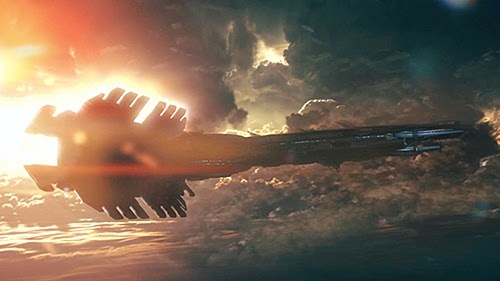 Technology - Some of the relics of this civilization suggest they not only could fold space for travel but they could teleport on a local level, utilized true energy field technology to make hard light contructs and were even capable of n-dimensional stable constructs. None of this technology has survived intact, but researchers are always looking for the holy grail of evidence. Caches - some of the last colonies to fall from this era retain caches of technology that remains largely intact, and mostly functional. Self-replicating machines known as exotics (free willed AI) have been found intact and mostly functioning. 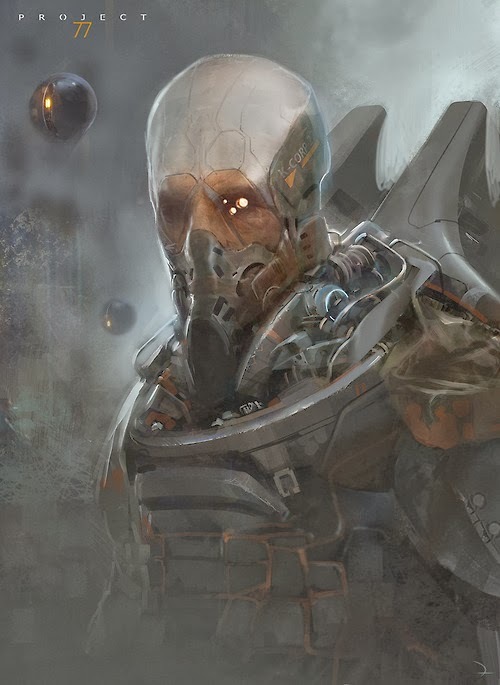 This tech is incredibly valuable and there is a constant conflict between different independents, Aegis Division agents, Academy researchers and agents of the Tetragon Union to secure these exotics and their caches when they are found. Exotics - Most exotics are psychotic and unable to communicate in any sensible manner, but they can learn quickly; one peculiar element of exotic design from these relic caches is just how hostile they are to the young species rediscovering them. An encounter on Sylas's fourth moon in Andrenor system led to the death of all researchers on hand when the exotic gassed them and then utilized their own technology to go after their ship the ISS Inscrutible. To date no one knows what happened to the Inscrutible after it's last transmission from the exotic AI which declared it self "Omega." Exotics that have been found and contained have been singularly unwilling to discuss any details of the era from which they harken. There are several theories on why this is: one is that the exotics were not programmed with that knowledge, or were programmed to guard it. 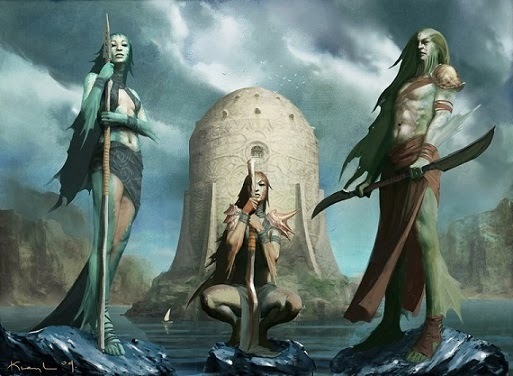 A second is that they are actually relic war-programs, and they react with hostility and suspicion by nature of design. A third is that their knowledge base was delberately erased. A final and likely suggestion is that their self-repairing nanites could not reliably keep their databanks intact for such a long period, meaning the exotics found today are thousands of generations removed from their original selves and have degraded too much to retain their programming knowledge of more than four million years ago intact. Exotics, despite the possibility of severe fragmentation, are still vastly superior in design to current AI tech. Modern free-willed AI are regarded as dangerously superior to their biological creators, but they are easily snuffed out by exotic defense routines. Even fadelik AI don't stand a chance against exotics. For this reason the only known exotics are kept in secure remote installations. The chance of smugglers or rivals getting their hands on one and letting it loose in the wild is always a risk, however....one Aegis Division tries to monitor and prevent. I've talked in previous actual play posts about 13th Age's advantages....now time to talk a bit more about what I increasingly perceive as a disadvantage, albeit a subjective one: the combat. Saturday night's game was combat heavy; the previous session was loaded with plot and exploration and role play. The next session was basically two very long fights, which had the advantage of being easy to manage without more than cursory use of map and minis, but also suffering from what I would describe as a problem of feeling "gimmicky" to me. This is indeed a problem, because its really a core conceit of the 13th Age fight mechanics: lots of gimmicks which "pop" under the right conditions, often tied to the natural D20 roll of an attack or the escalation die. For some this is a huge feature, but for me, despite thinking it would be cool, I am finding it instead is creating a sense of tedium as everyone tries to track when things can or should "pop." This feels less like a tactical experience to me (ala 4E) and more like some sort of collectible card game. Ahem. 1. Monsters still have too many hit points. Players have too many hit points. You have to summon impressive dailies or slaughter mooks (not satisfying) to do one-hit kills. This is a style thing, not a critique of 13th Age; I am just beginning to realize that I may not be in to "hit point pinata" games. 2. Monsters don't "do" enough. 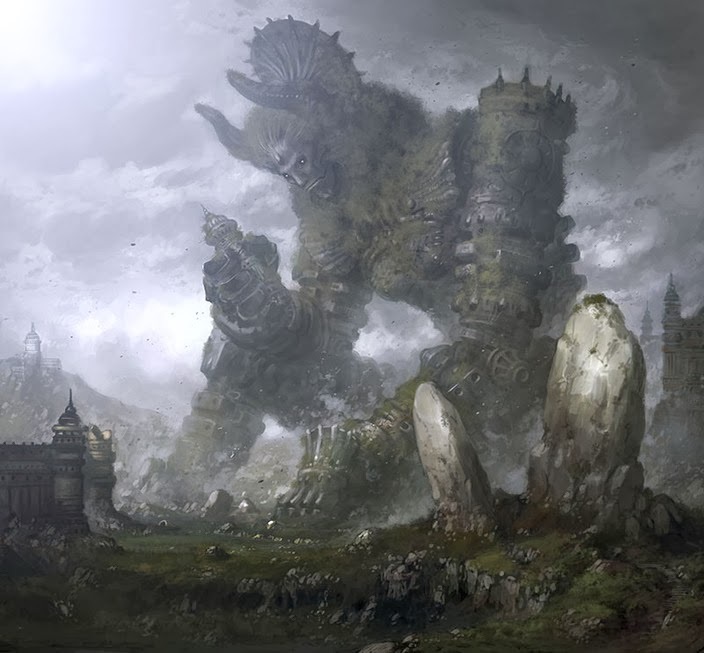 They have many features, yes...but it's highly programmed; the GM isn't so much as making smart decisions for the monsters as he is monitoring for when effects can occur based on whether you rolle even or odd, or over a threshold or whatever. Put another way: I am realizing that I like games where monsters have visible depth in their description and stat block. I do not necessarily like deep math behind the stat block...hate it, in fact; but I like a monster with more options than you can see executed in one fight; that sort of monster can hold more surprises for future battles. So 13th Age, like 4E, is better for GMs that want a statblock that tells them what to do to run the creature, rather than gives them a "monsters character record" and tells them to figure it out. I guess I like the latter, even if I like 13th Age's simpler core math. 3. The fights so far have still gone on too long even with the escalation die. Around turn three or four it always feels like "these things should be dead by now," part and parcel of the too many hit points option. I think 13th Age's escalating damage dice probably solves a lot of that at higher levels....we shall see; for this campaign I have decided to ditch the incremental advancement leveling system again and gone back to awarding a new level after every couple of fights. 4. Given how holistic and freeform the background system, icons system and ritual mechanics are in 13th Age, the weird "popping effect" mechanics tied to the dice actually feel kind of incongruous. 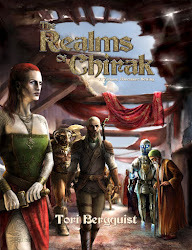 There's a great game hidden in here, that needs to be free of the detritus of 4E design. 5. I have decided that tying so much into the "natural roll" is at least tripping us up....no one's used to checking the die before remembering it may be relevant. Nor am I, so monster effects which depend on player rolls (i.e. 16+ natural on die to penetrate past skeletal resistance to weapons) get overlooked, or we have to scramble to remember what the original check was. This slows things down. I can see a future in which 13th Age is fast and smooth. I don't know if I have the energy to reach that future. Plus....I'm not sure I like this mechanic, anyway. Take the skeletons, for example; the "take half damage from slashing weapons" rule is so much simpler than monitoring the die roll all the time. I know this is a bit of a diversion from my super positive 13th Age articles recently....but after six combats, each lasting between 1.5 and 3 hours long, I am annoyed that the game didn't fix that issue with 4E. I really want a game that moves faster, or if it doesn't move faster than I want a game that feels like it offers some genuine tactical advantages and incentives to play. I do not want a game that can only offer it when the GM deliberately jerry-rigs the fights to insure it doesn't happen. 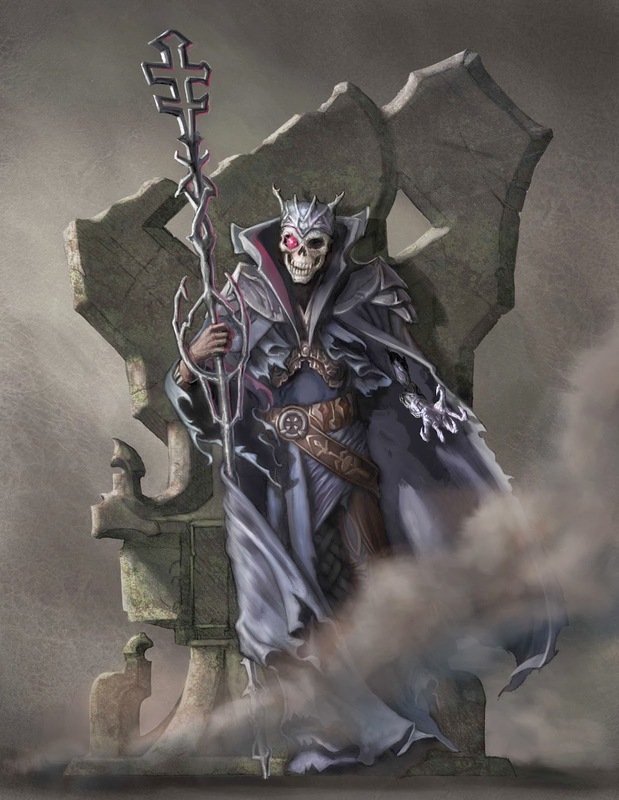 If I put a mass of two dozen undead in a region for the adventurers to stumble across, parlay with or attack as needed....I appreciate that they have a tough fight but ultimately mow down the undead. But honestly, I am favoring versions of D&D where this doesn't take half the night, or if it does then there's at least enough interesting going on to make it worthwhile. I can get that...barely!...out of Pathfinder thanks to having run it so much for so damned long. I know I can get a much faster experience out of various older editions of D&D. 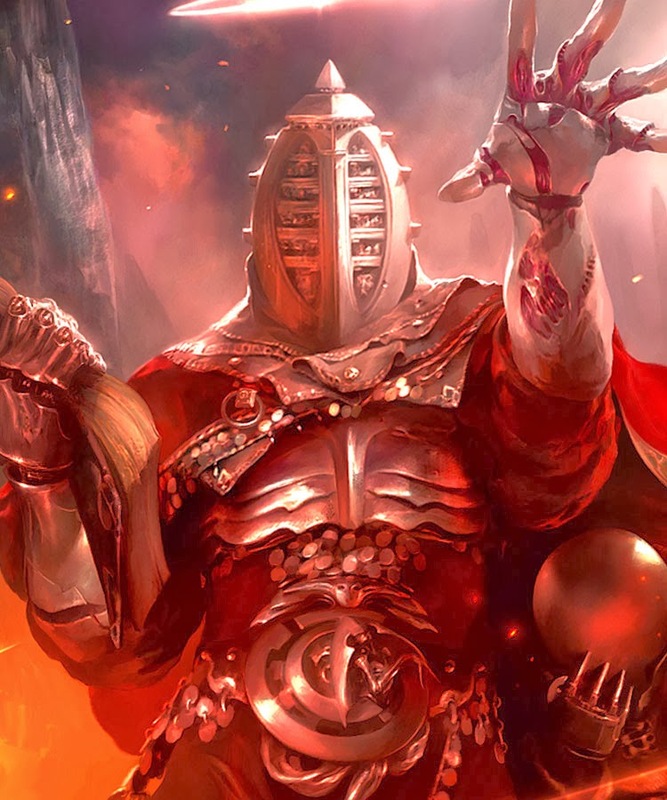 I seriously hope I can get that faster play experience out of D&D 5E; the playtest experience suggests so, but we still need to see the final version. Think I'll wrap up the 13th Age game in a few sessions and start some Savage Worlds up...see how that one fares with my off-Saturday group! Removing XP - or Changing the Way it is Rewarded?